Hola Mariucans! I finally got around to wrapping my Tokyo prizes LOL! I know I know I am so late in getting them to you but please accept my apologies. I've not been feeling myself lately. Been a little down this month and to keep myself distracted, I've been throwing myself into my work and blogging. But yesterday night, I sat down and finally unpacked my Tokyo suitcase and got your gifts together. To LJ, Emila and Ane - your prizes are finally coming your way! I will get them out by this week so keep a look out for Mr. Postman. Thanks again to my winners and to everyone who participated in my Where is Mariuca contest. As for my other blog buddies (you know who you are); expect a Tokyo gift from me too. I still have those to wrap, which I'll do tonight so they can all go in the mail at the same time YAY! Once again, I apologize for the delay, Mariuca loves ya! Good deed dalam bulan ramadhan kira bagus tu. :* :* :* :* :* LJ! Also something different today with JS is that I have my avatar showing up now and on some sites it is starting to pick up my feed also!! So I bet they are updating!! i am trying to get a thank you present finally made for Emila too. She sent me that wonderful bag months and months ago and I haven't sent her anything as a thank you present. But, nothing I had at the time was good enough. I wanted to send her something that I did or made too. But, I don;t do crafts and I don't sew. u can't receive comments by mail Mariuca? Maybe she will forgive me as soon as i track down her mailing address and get her gift to her. i think I have her email address. I will email her when I finish my drops and ask for her address!! hehe i took a break yesd; didnt drop at all! ohh Mariuca why like dat ah?? Wohooo.. cant wait to get my gift dearie.. yahoo!!! thanks so much!!! Better late then never they always say eh..
Woweee... 4796 to advertise on your EC dearie... fulamak!!! wow! 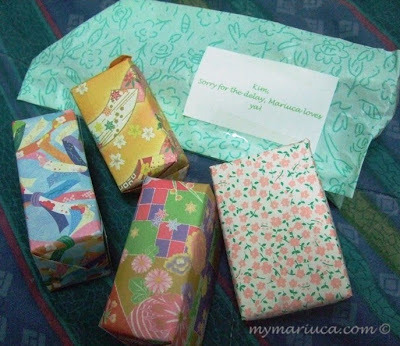 a huge congratulations to those who will be receiving gifts from you, mariuca. i know they all deserve them. you have a great day and stay happy! i saw yr reply Mariuca! Now I can see Mon, still not stable, so I “warned” Igor I’ll be bugging him again if this happens LOL! hahhahahah yr top meow is scared of meow!! LOL! what price widget for ec Mariuca? Finalmente is the word la Tekkaus he he! Ha ha ha sorry lambat Emila, posted edi so keep a lookout woo hoo!